After seeing these pics I touched in the bare patches I'd missed !! Very nice SE-5as , yes!!!! Last edited by 144sram; 08-26-2012 at 16:01. Are they hand painted or did you use decals? Last edited by flash; 01-27-2013 at 03:10. Reason: Delete Spurious Pics ! Heres my repaint of Dallas's Camo SE 5a that I did way back. Its McCudden's 56 Sqd G before he added the Red Spinner & the G was converted to a 6. The paint is Vallejo Brown Violet & the Decals were Herr Obersts British sheet with white numbers. Lloyd, be sure so yes. These repaints are great. I love seeing the differnt paint schemes. It was a three G&T case. I fancy doing my two se5a's like yours Rob. Neat lines! Really crisp. Last edited by Boney10; 10-07-2012 at 10:25. Very nice Chris. I could have done with those to help me out yesterday! Cyril Crowe and David Galley of 56sqn B Flight. 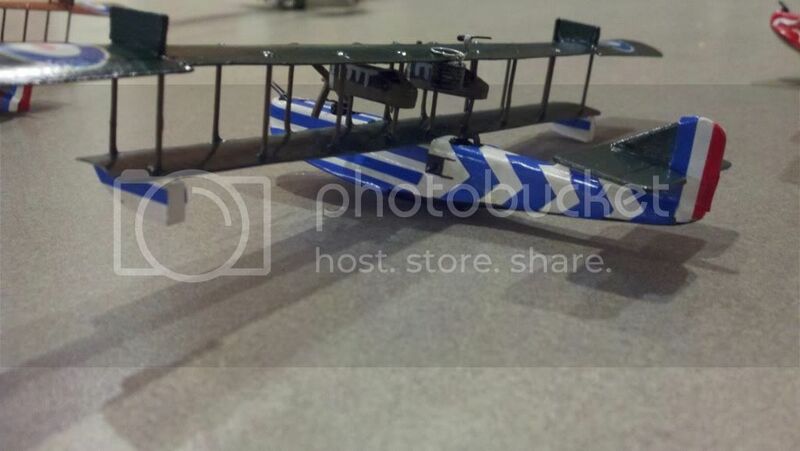 These are Shapeways planes made in WSF, designed by Decapod. Very nice! Excellent work! The elves are all clapping too! Eventually all my planes will have pilots too, lol! I have some ordered from Shapeways, awaiting their arrival so I can crew these birds! Nice looking Se5's I have 2 red eagle ones to repaint. I now have some inspiration. A triplet of Shapeways WSF SE5's: Cpt McCudden n°56 sqn, Cpt Mannock n°74 sqn, and Cpt Insall n°50 sqn (my own take from a 1918 picture). The pictures make the PC 10 appear greener than it looks IRL on the miniatures. Good looking birds, Eric. Which decals did you use? For the roundels, Mehusla (Ebay). The letters are from an old set of RAF/Royal Navy stencils. The rest of the markings are done with the good ole paintbrush. You have made a really good job of those Eric. they would grace anyone's games table. Great looking SE5s! And well-chosen, too. They look like factory product. I would never be able to tell they were Shapeways. Amazing job! You can see the WSF is still grainy in places. Photos of all six in the Squadron Thread (Entente)! Great looking SE5! Was that a Bishop? Yes, all six were! Not any more! You have made a neat job of that Tim. The system for mounting your magnet is interesting. Mrs Kyte's remark that it was certainly not a WWI AWAC cracked me up. I didn't even know she knew what an AWAC was. Ah... to have six Bishops. Would need to rob a bank in order to afford that many! I like that method! I may start doing mine that way as well! My first custom paint, Valom RAF SE.5a, She still needs a little work though. A very tasty piece of work James. Thank you, I really need to get some "Proper" acrylics as Im using Citadel paints and having to mix colours to match. James a suggestion if I may. Vallejo Model Colour Brown Violet is a very close match for British PC 10. Funny you should say that! But I picked up one of their colours today - USA Olive Drab though and these are MUCH cheaper in Japan than citadel paints.... almost half the cost! Some very nice aircraft gents, great job. Nice job James - Frank Ormond 'Mongoose' Soden was credited with a couple of kills with this kite whilst he was with 60. A totally fictitious scheme and my own initials. Needs some touching up and some roundels put on the fuselage. Definitely something R.N.A.S. about that paint scheme. Last edited by clipper1801; 06-26-2014 at 10:01. Many thanks - I found the fuselage roundels this morning while tiding up the office so once I have touched up the underside and the wing tips I will put those and the lettering on. Although I think I will need some black with white board stencils. Excellent paint scheme, James. Did you use white decals or paint and masking tape for the white areas? I used masking tape - I use 3 layers of white acrylic primer and then a light wash of pure white. Then leave over night to fully dry, then mask up all the areas that I want to remain white. Then again once dried over night I remove the mask and reapply for the second colour, this time blue. Once all coats are dried I then apply washes to create more shadow followed by some dry brushing to show the edges - finally followed by the varnish. The aircraft above still needs some touch up and washes on the underside as well as some weathering. For the record I took a 20 year break from painting miniatures and the Wings of War and X-wings miniatures are the first in a very long time! Superb job there James. When you come onto your shapeways you'll have no problems. Excellent work, James. I like the scheme and personalization very much.